This is one of the classic excuses that children tell their teachers whenever they forgot to do their homework – blame it on the dog. Could it be because that cats do not have such a voracious appetite that our feline friends are let off the hook all the time, and the canine fraternity is the one that has to pick up the slack? 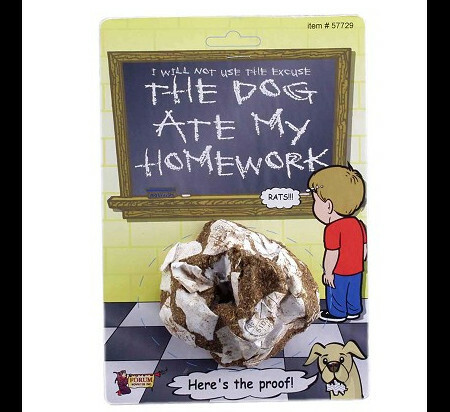 Regardless, you might want to try your luck with the $2.95 Dog Ate My Homework Prank that adds a dash of authenticity to the entire situation. It looks gruesome at first glance, as though a dog would actually chew up and swallow your homework. It is basically a prank poop with shredded fake homework within.